Hallelujah! Christ is risen!” We respond with another exclamation: “Christ is risen, indeed”! “But if God himself has taken up residence in your life, you can hardly be thinking more of yourself than of him. Anyone, of course, who has not welcomed this invisible but clearly present God, the Spirit of Christ, won’t know what we’re talking about. But for you who welcome him, in whom he dwells—even though you still experience all the limitations of sin—you yourself experience life on God’s terms. It stands to reason, doesn’t it, that if the alive-and-present God who raised Jesus from the dead moves into your life, he’ll do the same thing in you that he did in Jesus, bringing you alive to himself? When God lives and breathes in you (and he does, as surely as he did in Jesus), you are delivered from that dead life. With his Spirit living in you, your body will be as alive as Christ’s!” (Romans 8:9-11 The Message). The disciples asked that question. So did the throngs of people who must have felt like they were on a roller coaster ride of emotions during Holy Week. Consider Jesus’ Palm Sunday march for life, to Good Friday’s crucifixion and burial. Wow. What a change in mood. Huddled together for comfort, the followers of Jesus stressed and grieved in clouded faith. Now what? We know the story. Though Jesus’ death and resurrection was predicted, that Jesus Christ would somehow rise from the dead was still unexpected. After Easter, life would be different for sure, but not in the way they might at first have imagined. Since I was a kid, church was a part of my Sunday morning routine. That’s how it was for many people in the 1960’s. Actually, from the 1940’s until the 1970’s, everyone seemed to belong to a place to express their belief whatever the religious preference, Jewish, Roman Catholic, Presbyterian or other Protestant tribe. Of course, this is not our experience any longer. As we pay attention to our communities and the social trends, we have come to learn that you do not need to belong to express one’s belief. You don’t have to join to formally be a part of a group or church to feel like you belong. What’s more, you don’t have to attend regularly to somehow prove or confirm your connection. Expectations are different now. There are more options and opportunities. 50 years ago high attendance was the norm. 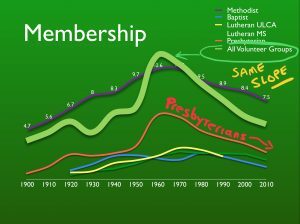 But here’s an interesting fact: During the same period, say from 1940 through 1970, the time of peak church attendance in the United States, all other non-profit volunteer associations were on the rise, as well. Think about that. When many churches began experiencing steep declines in attendance, so were the Rotarians, Lions, Optimists, Boy Scouts, and Woman’s Leagues. (Here at Cold Spring Presbyterian Church, our manse and Price Hall was built at that peak time.) Most new church construction and expansion projects occurred then, too. 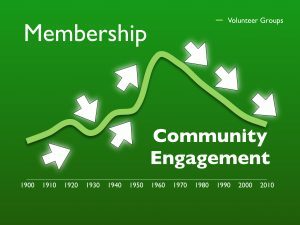 To understand the church decline, we should try to understand the decline of other volunteer groups, and here’s what we have learned: The fewer community connections the volunteer groups and churches had, the fewer members resulted. And the inverse is also true: Volunteer groups and churches that grow are more deeply connected to their communities. “Later on that day, the disciples had gathered together, but, fearful of the Jews, had locked all the doors in the house. Jesus entered, stood among them, and said, “Peace to you.” Then he showed them his hands and side. The disciples, seeing the Master with their own eyes, were exuberant. Jesus repeated his greeting: “Peace to you. Just as the Father sent me, I send you.” Then he took a deep breath and breathed into them. “Receive the Holy Spirit,” he said” (John 20:19-23). Instead of retreating, Jesus sent them out. Though they likely wanted to stay safely secluded to recall the recent Palm Sunday festivities, Jesus has a different plan. We are on a transformation journey. 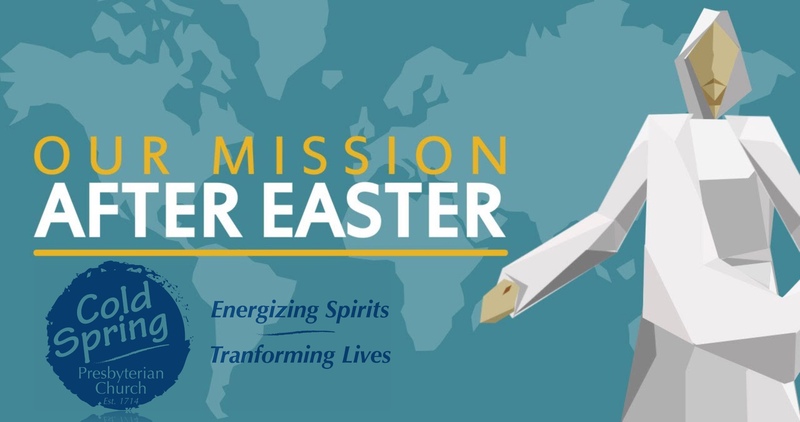 We can start with the Easter Good News ringing gin our ears by choosing to be a good neighbor, putting love into action, with a spirit of generous reciprocity. We can be sure that as we practice good discipleship, our commitment as a follower of Jesus Christ means we also practice good citizenship. We demonstrate transformational behaviors by listening to the cries of the poor, becoming more of a neighbor-church. Then God’s story and God’s message will ring out, and our faith in God will become known everywhere (1 Thessalonians 1:7-8). We listen. We serve. We grow. We learn. Let’s do more of that! Churches that transform to establish new community connections become thriving communities of faith!